A reminder of all that's beautiful in the world, from kindness to Chianti. Rose Quartz: Love, peace, compassion. Green Fluorite: Cleansing, positive energy, awareness. Crystal Quartz: Peace, positivity, clarity. Lapis Lazuli: Wisdom, truth, intellect. Stephen is inspired by the union of logic, creativity, and nature. He uses his background in math and digital design to make modern, organic creations with jewelry-grade stones. Stephen conceptualizes and handcrafts each piece with care in New York City. Looks pretty on a wine bottle! 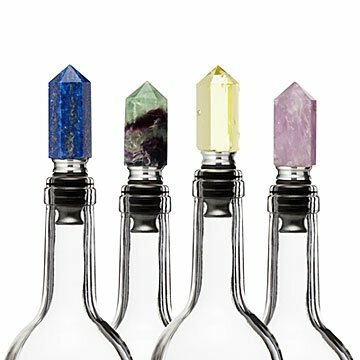 I can't stop looking at the rainbow fluorite wine stopper. The natural purple and green colors in the stone are so beautiful. The wine stopper is made well. I like that it's made with real stainless steel which is food-safe. This was made very well and was a beautiful crystal. Does the job of sealing an opened bottle and elegant. I ordered the Green Flourite stopper as a Christmas gift for my Mother. It shipped quickly with a handful of other items, but it arrived severely damaged. The gift box it was packaged in was torn apart, so the stopper itself was just floating around loose in the big shipping box with all my other items. It was unsurprisingly all chipped up. It almost looked as if someone had previously ordered it, roughly opened it, and then returned it. It's baffling to me that it could be sent to me in that state. While I am happy with the other items I ordered, I would never purchase this item again. These wine stoppers were the perfect solution for when I wanted to gift more than a simple bottle of wine. I love the amethyst and rose quartz because the color of the stones is so beautiful and so is the meaning behind the stones. For my boyfriend, I chose the blue lapis stone. It's a wine bottle stopper. There's only one way to use it as far as I'm concerned. I ordered a citrine wine stopper. Citrine is supposed to be yellow just like in the picture. The wine stopper chosen to be sent to me is a ugly shade of gray/brown. No yellow. I work with crystals daily and this was supposed to be a secret Santa gift for a coworker- no way could I gift this. This was also my first purchase with uncommon goods and this is disappointing. 2 of the 5 items ordered were either damaged or not what was advertised. The lack of consistency in product quality makes me nervous to order anything again.